Yesterday, I looked at the 2010 local government tax rates for municipalities in the South of Fraser and compared the rates to other municipalities. I noted that because the provincial government pays the hospital tax in Metro Vancouver, even with TransLink, our rates are comparable to other municipalities in BC. Of course housing costs vary throughout the province, so a better way to look at taxes is to look at the average house. The following chart shows the average tax that your typical single-family household would pay. 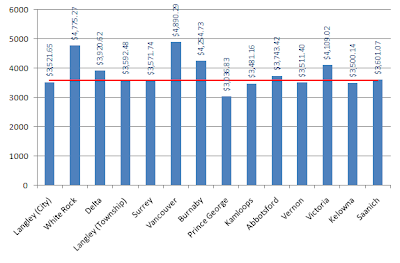 The most interesting observation is the fact that Abbotsford residents pay more tax and have a higher tax rate than Langley or Surrey. We also know that Abbotsford has crappy transit. If I was a politician in Abbotsford, I would be knocking at the door of Metro Vancouver to join the region: lower taxes, better service. 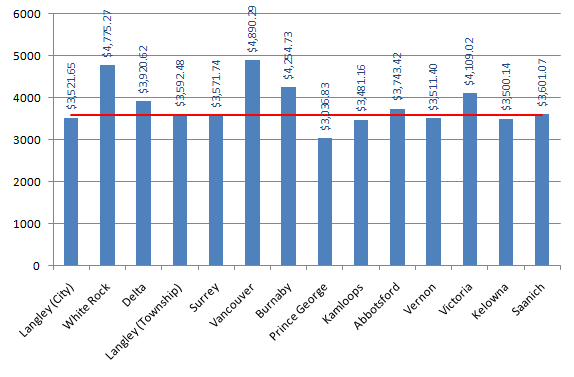 While some people in the South of Fraser like to complain about the "cost" of being in Metro Vancouver and TransLink, I would suggest that they wake-up to the fact that we pay some of the lowest taxes in the province (for large centres) and get some of the best transit and local government service. Of course there is much more that can be done, but it's good to know that we have a base from which we can grow.